I have a wedding coming up! Not my own, that was a while ago, but a wedding nonetheless. Like any normal woman I am already worrying thinking about what I am going to wear. Mercifully, we are not taking our children to this wedding, it's not a fun day for anyone when that happens. Instead we are going as a couple, it will be nice to just spend some time together, like a date! Apart from all the people around us of course! Anyway, although I have quite a few dresses that I have only worn once, since I hardly ever go anywhere that warrants wearing a dress, it seems a shame to wear something twice doesn't it! For me, it's quicker and easier just to search on a department store's website as most high street stores can be found on there anyway, and it means everything is in one place, for this purpose I've chosen House of Fraser. 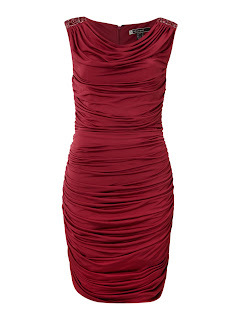 Since I've lost loads of weight recently, I want to choose something quite figure hugging without looking ridiculous. I quite like the ruching effect perfected by Isabella Oliver, however they don't do anything "dressy" enough for a wedding, so I'm looking elsewhere. 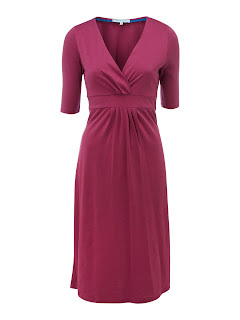 First port of call is good old LK Bennett, I like this Ariella dress in Fuschia and I also like the fact that it can be dressed up for a wedding, but dressed down as well for the day. I actually tried it on in store the other week and it was most flattering, the ruching definitely covers all lumps and bumps and you can adjust the neck in different ways to make it quite versatile too. It's in the sale too, £95 was £185! (it was £110 on Saturday!). 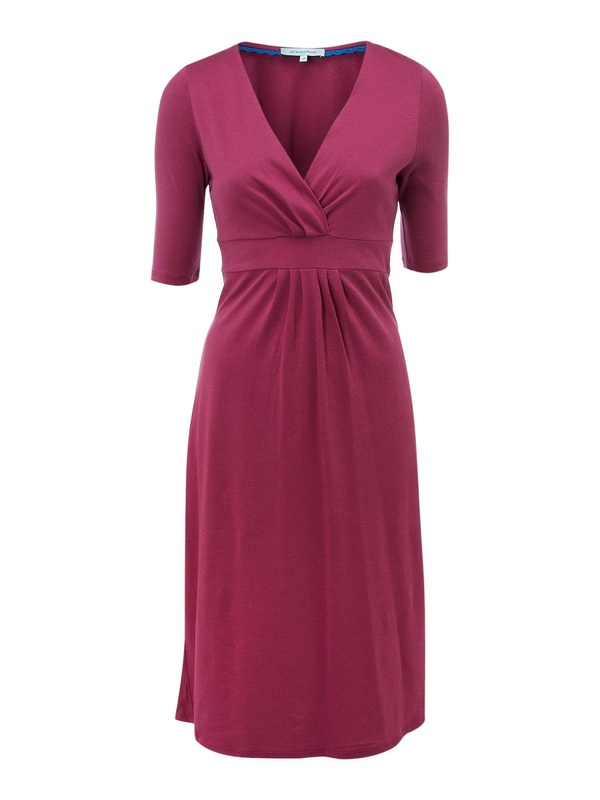 I also like this Slinky Knot Jersey Dress from Pied a Terre, (£180)though I didn't know they did clothing as well as shoes. I saw someone wearing something similar at a party recently and she said it was from Pied a Terre, it looked really chic and flattering. There are also loads of colours and also a long sleeved version, very difficult to choose! 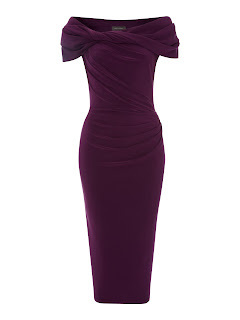 I love the shape and wide neckline to balance out my broad hips, though it goes without saying that this is a dress that MUST be worn with heels. Quite pricey but I think you could wear this for years to come. 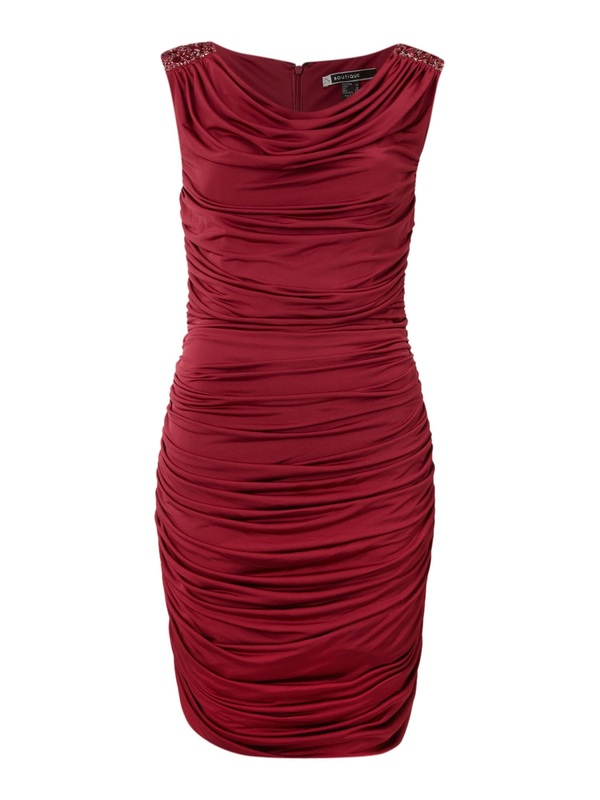 I love this little number from JS Collections, again ruched and very flattering looking. It also gets good reviews and is in the sale! Result! The dark pink is very flattering and I think would go with any skin tone, there are also plenty of other colours that go with this, namely black, so you don't need to splash out on new shoes as well. Was £150 now £75 with loads of sizes left. And finally, what a bargain from Dickins and Jones, was £70 now £17.50! They only have a size 10 left but I reckon this would fit up to a 14 as it's flattering jersey material. It's not ruched or tight fitting, but it's a great day dress and I like it! 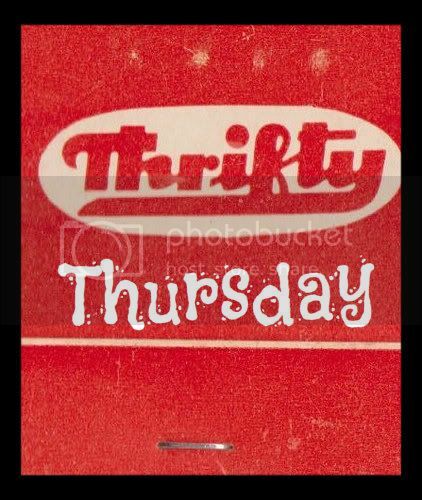 Plus, what a bargain! A great Christmas day dress. There are hundreds of other dresses on the website, for more dresses, click here. That's interesting about Gok- do you mean the sainsburys one? I also love the LK one - the one I would wear is pink but couldnt get a decent pic of that one. I do like the pied one just not sure I can spend the money! I like the pied a terre one. A nice festive/ autumnal colour too - and a change from black. Easy to accessorise with black shoes/ bag too. Yes that's true about it being Autumnnal. They have loads of colours in that dress but that's my fav. What about the cost thoUgh! Thanks I had a look at that blog. I really need to stock up on accessories so i can do stuff like that. Theres a Reiss cuff in their outlet store for £18 Iighy start there!